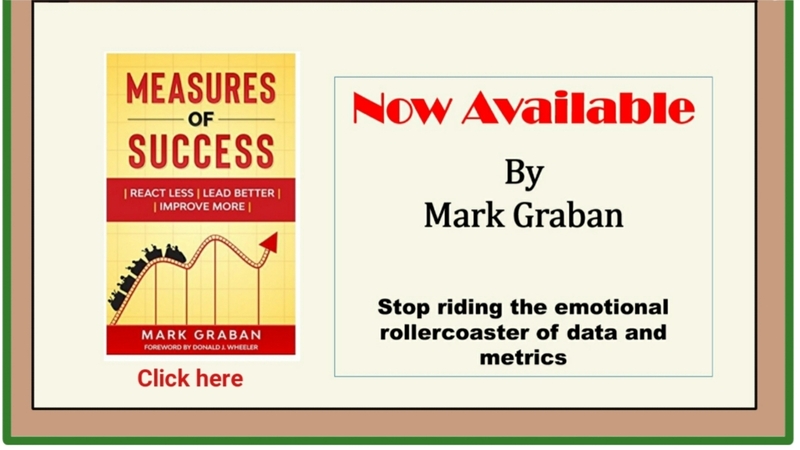 This past January, Mark Graban and I had the honor and pleasure of speaking at the 2019 American Veterinary Medical Association's Veterinary Leadership Conference in Chicago. The title of the 90 minute lecture was The Lean Concept of Kaizen: Taking Your Practice To the Next Level...And the Next! The attendence was good. 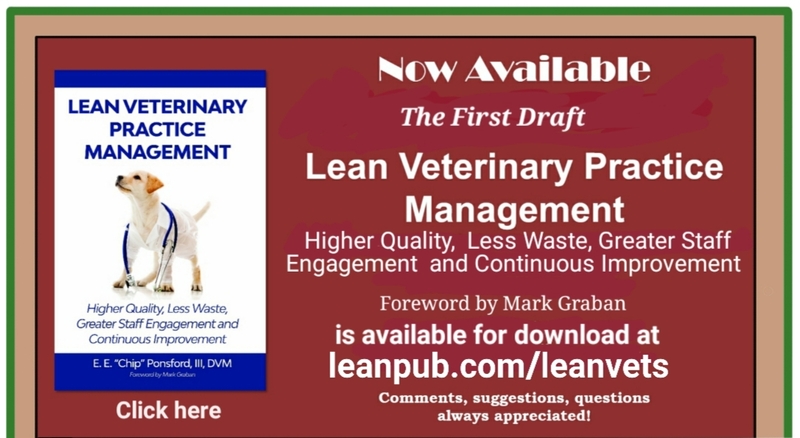 I started the session with a brief introduction to the history of Lean, starting with Lean manufacturing through Lean management and Lean healthcare to ,now, Lean veterinary medicine. Mark, then, took over in his usual dynamic and enthusiastic style. He explained the literal and common definition of kaizen, why it is a better system than suggestion boxes, the PDSA cycle, and ending with a description of a simple kaizen system using Idea cards, Summary cards and a conspicuous Idea board. Along the way he gave numerous examples from both human and multi-species (veterinary) healthcare. Just a few days earlier I presented a one hour webinar entitled The Lean Methodology: Evolution of Veterinary Practice Management for the AVMA's Lead and Learn webinar series. 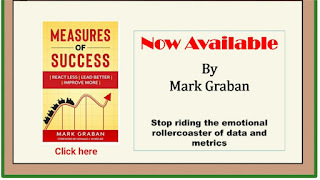 For this webinar I took the approach that the Lean mindset is very much akin to the scientific method of diagnosing and treating disease, which we as veterinarians are extremely familiar with. I tried to demonstrate that in both cases we have an ideal vision (Health and True North), we perform a physical exam (in Lean it is go to gemba and create a current Value Stream Map), we define our current state and, then, list the gaps between the two conditions (master problems list). At this point both methodologies analyze the list for root causes (tentative diagnoses) and perform an experiment (treatment) with their respective tools and processes. At the end of the experiment, we assess our success, or lack thereof, and either sustain the new condition or experiment again with a different set of countermeasures. I haven't recieved any follow-up from the webinar, but attendee scores for the lecture were very satisfying. 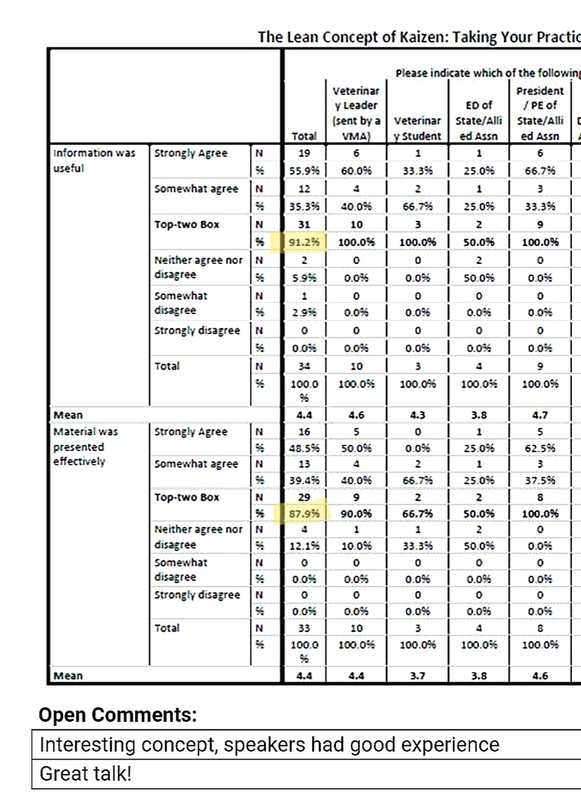 As the results show, 91.2 percent either agreed or strongly agreed that the information presented was useful. 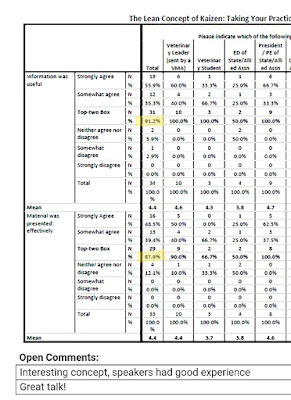 In addition, 87.9 percent either agreed or strongly agreed that the material was presented effectively. 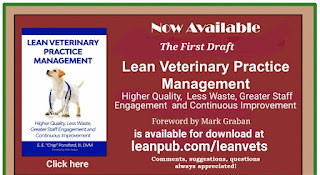 Lean is starting to make its way into veterinary practice management. Something that Mark and I have been advocating for the past three years. But, even more exciting is that others within our profession see it as valuable. That has always been the benchmark. Lean is not a complete abandonment of all the concepts of traditional management; it is not a dogma. However, many of the older, traditional management concepts are challenged by this different mindset. Just as a computer language does not dictate what program or application is produced; it only supplies the means. Lean is, also, an infrastructure...for adaption and continuous improvement in practice management. The AVMA Lead and Learn webinars (including mine) are available for viewing free of charge to members here. Thanks for stopping by. Dialog is always welcome.